Earlier in the day yesterday, I was talking with a friend about how awesome it would be to watch your team win every game for the rest of the season. Of course that would be fun! Who doesn’t like winning, right? Unfortunately, just like they say about a journey of a thousand miles starting with first step, an epic winning streak starts with the first win. And last night, it just wasn’t happening for the boys in red. Freese wen 3-for-4 at the plate, but also had 2 of 3 Cardinal errors. It was a game filled with little frustrations that led to big problems — initially, both ways. 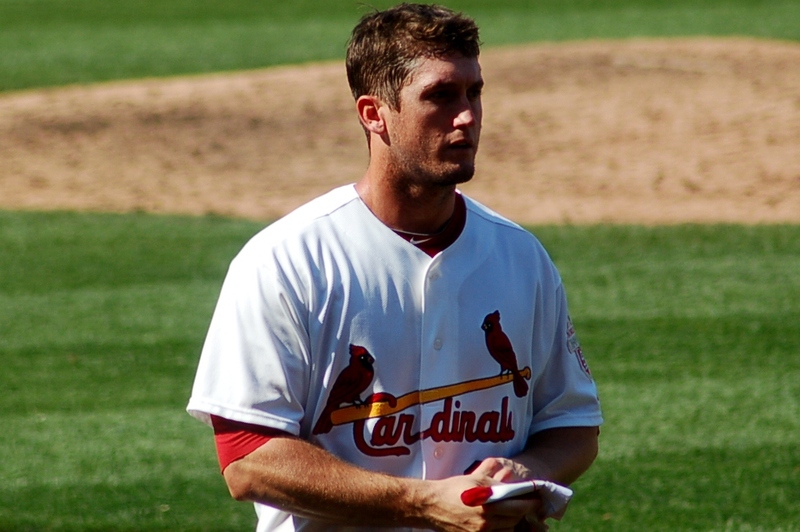 The Cards struck first in the second inning, scoring on a double by All-Star David Freese. But, that was after the Marlins’ first error of the night: a throwing error by Jose Reyes that allowed Allen Craig to move into scoring position ahead of Freese. I know, I know. They’re called errors because he should have made the plays. But four of five batters in the inning hit balls right at Freese. And after the wild throw in the first one, a slightly-less-wild and manageable-for-Descalso throw on the second one, you could just feel the tide turning. The second error cost a run. And there was still just one out. Well, he was half right. Then again, I can’t really say if he was right or wrong — I have no idea what Freese was thinking! But, regardless, the fifth batter of the inning hit another drive straight to David. This time, fortunately, he turned the inning-ending double play. Still, though, problems were ahead. In the bottom of the inning, Freese led off with a single. Descalso followed suit. But a ground out and a double play killed the attempt. In the seventh, after giving up the go-ahead run (and tallying another error), Jon Jay doubled with one out. Back-to-back ground outs from Holliday and Beltran once again killed the rally. A homer by Logan Morrison off of Maikel Cleto in the eighth ultimately was the nail in the coffin. The ninth inning comeback — Skip Schumaker scoring after a double of his own to lead things off — ended with two on and two out. Yet another ground out ended the chance. Actually, the inning was potentially more costly than even the loss itself. Rafael Furcal was removed from the game after running out an infield single. Then, Matt Holliday was plunked on the elbow by Marlins’ closer Heath Bell. So back to the idea of capitalizing on chances. The Cardinals out-hit the Marlins 12-6. They were a dreadful 2-for-16 with runners in scoring position, leaving 11 men on base. I’m beginning to think it’s a special kind of skill to hit that much, have that many base runners, and still not score more than two runs. Is there an opposite of “clutch?” Because that would probably describe tonight. Even when good things happened, they didn’t happen at the right time, they didn’t make a difference. Certainly there are questions about decisions from the bench — why Tony Cruz didn’t bunt the runners over with two on and one out in the sixth (Westbrook would ground into an inning-ending double play after Cruz grounded into a force out), leaving Cleto in to face a lefty instead of bringing in Rzepczynski (who was warming up). But truthfully, those moments shouldn’t have mattered. Not if the job had been done at other “clutch” moments on the field. Regardless of where you place the blame, the miscues added up, the chances went unused, and the Cardinals dropped the first game of the series 3-2 to the Marlins. The good news is, the Pirates lost. The bad news is, the Reds won. Chalk it up to another couple of missed opportunities. But, today’s a new day. Here’s hoping the weather cools off, but the bats heat up! And, of course, for another memorable outing for Kyle Lohse against Carlos Zambrano. Hey, who says that crazy winning streak can’t start today?